Train with Purpose. Race with Heart. Do You Have What it Takes to Qualify for Boston -- and the other Marathon Majors? The World Marathon Majors have been rolling out qualification standards that, similarly to those of the Boston Marathon, give runners who meet a certain finish-time criteria a chance to forego the lottery. Do you qualify? Check our tool to find out. These Thank You cards, letters, emails, and online messages from my runners are why I have the best job in the world! i have so much gratitude for all the time, energy, and patience that you put into training me. 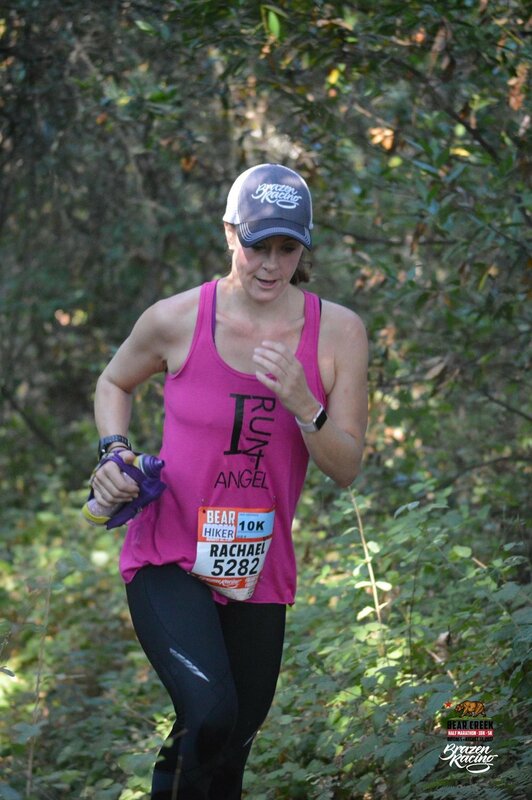 you engineered a runner who qualified for western states and Boston, in eight months! Really amazing. please know that you are doing exactly what you were meant to do for your career, you truly have a gift. ..."
...Thank you for helping me get immersed in the tri and run cultures -- and without injury!! I truly never thought a half marathon was in my future and it came in just one year! What's next?? Aleks is an outstanding athlete and the best coach I could have wished for. I started working with her in spring and she made me qualify for Boston within three months! I did not make it in by one second but I have no doubts she will make me qualify again. I am very grateful to have her in my life and look forward to working with her in the future. And hey - who would have thought track meets at 5:30am can be so much fun?! -- Maria, mom of three; training for her fourth 26.2 and second 50k. I wanted to thank you for being such an amazing coach! You took an out-of-shape, injured runner back to where she had been pre-injury. I'd been intimidated to try track workouts on my own, and forget about working out with others! But I knew I needed to do something and I wasn't going to do it on my own. You explained the drills clearly and made them both challenging and fun. You've pushed me to go faster and farther when I didn't think I could. Your patience and humor have made 5:30am track workouts something that I look forward to. It's the perfect amount of hard work and play that I needed to get my running mojo back! With minimal weekly mileage under my belt, a trail 50k sounded impossible. 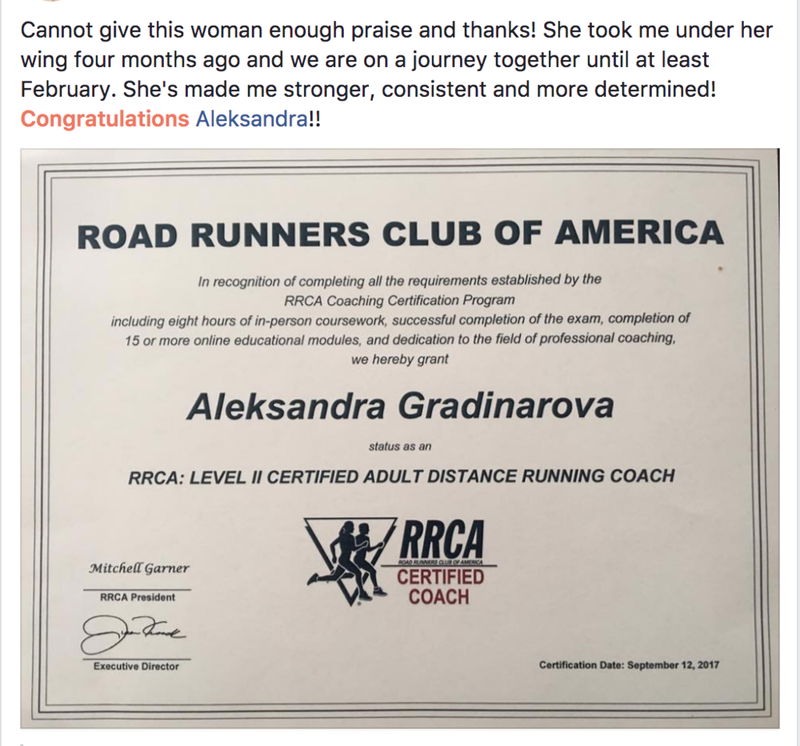 I reached out to Aleksandra and much to my pleasure, she agreed to take me on and coach me through training for the 50k. When we started I had a lot of self-doubt about my ability to train and run such a long distance, but coach Aleks had faith in me from day one. Aleksandra took me through week after week, through aches and pains, and through my complicated schedule that necessitated the constant shifting of runs. Throughout my training my only goal was to cross the finish line, and to make the cut off time of nine hours. I followed Aleksandra’s plan to a T, and before I knew it race day had arrived. I was nervous and anxious. I went out strong knowing that the only thing that mattered was a finish, but I ended up having a perfect and flawless race; I could not have been better trained. I was strong and confident for the entire race. I never hit a wall, never got tired, and did not have a single ache or pain. I crossed the finish line with almost two hours to spare and I could have run another ten miles. Not only did Aleksandra train me to run to the finish, but she also showed me how to believe in myself and my abilities. I cannot imagine training for a race without her.